Custodia ottima con un leggero segnetto sul retro (come da foto). Cd come nuovo, sul libretto delle istruzioni in alto vi è l’alone dell’adesivo. 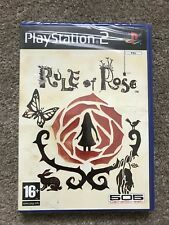 RULE OF ROSE PS2 PAL NUOVO SEALED-NUOVO MAI APERTO. La condizione Nuovo. Titolo: RULE OF ROSE. piattaforma: Sony PlayStation 2. platform: Sony PlayStation 2. versione: PAL originale italiana. version: PAL original. • possible delays or loss. CHOOSE ON CHECKOUT PAGE. fully working. RULE OF ROSE. GIOCO NUOVO SIGILLATO. Gioco aperto e poi risigillato , perfetto in condizioni pari al nuovo mai utilizzato dvd a specchio e manuale nuovo . Rara versione 2006 non censurata, rarissimo. RULE OF ROSE | PS2 | PAL-ITA | NUOVO - SEALED - NEW Vendo RULE OF ROSE nuovo, se avete qualche domanda non esitate a contattarmi sarò a vostra disposizione. CONDIZIONI GENERALI VIDEOGIOCO E PARTI... NUOVO! (N.B) NON MI ASSUMO RESPONSABILITA' SU EVENTUALI PROBLEMI O SMARRIMENTI DA PARTE DI POSTE ITALIANE, CONSIGLIO LA SPEDIZIONE CON LA RACCOMANDATA IN MODO DA EVITARE POSSIBILI SPIACEVOLI CONSEGUENZE. ----------------------- Vi ricordo di seguire il mio profilo ebay, troverete moltissimi videogiochi, console e carte pokemon sempre in vendita. There is a couple of sticker marks which I have not tried to remove since getting this gem. Jeu complet version francaise en excellent etat. HIGHEST GRADE IN THE WORLD Up for sale is the holy grail of PlayStation 2 games. Rule of rose extremely rare UK pal version fully in English. This is brand new and sealed and has been graded by vga at a 90 which is the highest grade for this game in existence. Own a piece of history. For anyone not aware this version was never officially released due to being pulled by the publisher days before hitting the shelves. Prices at £2500 I am willing to negotiate on the price so will add the best offer option to the listing. Any questions please don't hesitate to ask Will be shipped by Royal mail special delivery. International buyers please ask for a shipping quotation prior to purchase. Many thanks. Vendo Mambo per PS2 perfettamente funzionante in versione PAL ITA, condizioni come da foto, si consiglia di visionarle tutte. Spedizione gratuita con Corriere 48h. Vendo Splatter Master per Playstation 2 versione PAL ITA/UK/FRA testato e funzionante, condizioni come da foto, si consiglia di visionarle tutte. Spedizione con Corriere 48h. Vendo Gunvalkyrie per XBOX Completo PAL ITA, condizioni come da foto, si consiglia di visionarle tutte. Formula as is, visto e piaciuto. Spedizione con Corriere 48h. 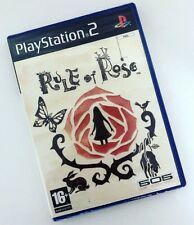 Rule of Rose " Sony Playstation 2. Condition: USED. We will provide you high quality products from Japan. We are waiting for your order. RULE of ROSE ROR. HTF Hard to Find. PREVIOUSLY OWNED AND IN GOOD CONDITION. New > Very Good > Good > Fair < For Parts. [Condition]. Condition Level. No Longer Produce. Haunting Ground. Rule of Rose. Tested and working. This game is complete with the disc, case and manual. The case and manual are both in very good condition. The disc has a very minor scratch on the front and some minor surface scratching on the back. The scratches do not affect gameplay. The game was played until its ending without any issues. Will provide more pictures if requested. Rule of Rose PS2. Minor Flaws. READ DESCRIPTION!!!! 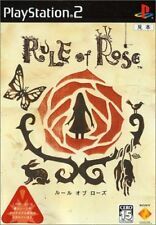 Rule of Rose for Playstation 2. Some minor flaws. Accidentally spilled Diet Coke on the case. So artwork has some minor blemishes on it and the bottom left hanger where the manual goes is a little loose. Everything else is fine. Please message for any questions. See fan websites for this info. Languages: Japanese - however is easy to play. Condition: Very Good. Only use EMS for Italy/Spain. ASIA and AUSTRALIA FREE to most of Asia. any location. _gsrx_vers_841 (GS 7.0.16 (841)). We will be happy to resolve the issue with you. Contents: Disc, Box, Instruction. Very Good Condition A little wear and scratches. Entirely contents are in very good condition. Rule of Rose Japanese Format (NTSC-J). I will try my best to resolve the issue. Want your item(s) as soon as possible?. Condition: New. height(cm)2. Release Date: 2006/1/19. Condition: Used, Good condition.